The Russian forward of the Pittsburgh Penguins continues to terrorize his opponents and score for his team, which is now leading in the NHL Eastern Conference. 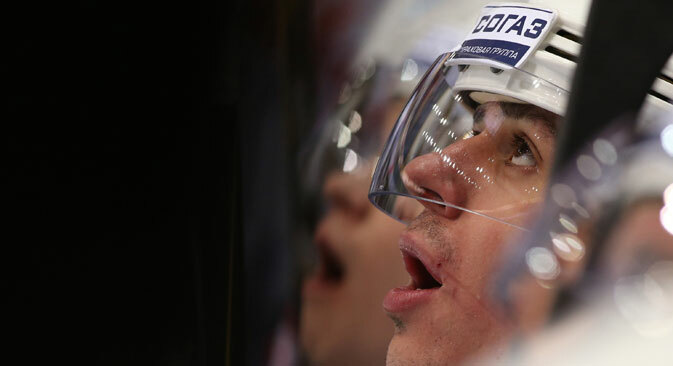 Russian hockey fans are hoping the recent, stellar performance of NHL star forward Evgeny Malkin won’t burn him out ahead of the Sochi Winter Olympics, where he is expected to join the national team. Malkin, a forward for the Pittsburgh Penguins, for the second week in a row was named Best Player of the week by the National Hockey League. At the beginning of the season, the Penguins forward heard plenty of critical comments about his playing. Malkin was making assists regularly, but not any goals himself. Nevertheless, by November, he had gained his optimal condition, which immediately showed up in the personal statistics of the forward. Last week, the key Pittsburgh player scored nine points in four games: Malkin scored three goals and made six assists. It is significant that the Penguins managed to gain seven wins out of eight possible, having lost only to the Boston Bruins in overtime. At that, Malkin was recognized as the game’s most valuable player twice on November 27, when his two goals and an assist helped Pittsburgh win the seemingly hopeless game against the Toronto Maple Leafs. Trailing 1 to 4 during the game, the Penguins snatched victory in the shootout, and the game ended 6 to 5. Then three days later, Malkin played another masterpiece match against Florida Panthers, having scored four points (one goal and three assists). As a result, Pittsburgh won the game with the score of 5 to 1 and a strong leadership in its division. Once again, Malkin was recognized as the game’s most valuable player. No wonder Malkin won another individual award as a result of such a productive week. Two forwards of the Penguins are at once at the top of the NHL score table now. And the leader of the national team of Canada, Sidney Crosby, is just one point ahead of Malkin, the leader of the national team of Russia. “I hope to see both of them there at the end of the season,” said Dan Bylsma, the coach of Pittsburgh. So far this season, the Russian forward has no rivals in the ranking of most assists: Malkin has made 28 assists this season. If Malkin preserves his form for another two months, the hosts of the ice rink in the Sochi Olympics will have, perhaps, the strongest argument for a final triumph.